Good morning! Well, I happy to say that Sydney has not gotten any worse. I guess, however, that is probably because we have kept her drugged fairly well. I am anxious to see how she is feeling this morning. I don't expect a miraculous recovery but I would, of course, love it if she was better. Clearly yesterday she was feeling well enough to go to school. However, I am doubtful she would have missed it anyway. You see, yesterday was the 40th Anniversary of Southwest Christian School. It was a day of dress up and she had been planned on it for quite a while. 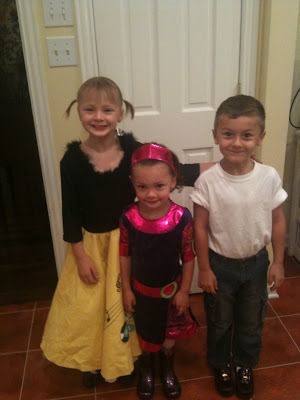 The kiddos were given free reign to dress up in their favorite 50s, 60s, or 70s attire. As you might expect, the Dungans were decked out in their full regalia. It isn't the greatest picture but at least you get the idea. Please note Sydney's poodle skirt, Ainsley's flower power go-go boots, and Grahams magnificent muscles. Well, I had best be off. I am anxious to see what purpose today will hold.